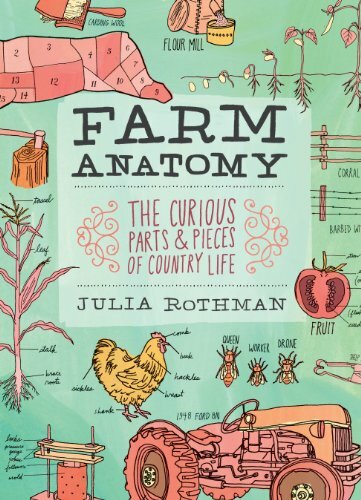 Farm Anatomy: The Curious Parts and Pieces of Country Life is a visual journal of Julia Rothman on country life and life on a farm. The inspiration for the book comes from living on the farm where her husband's grandparents live. This can be considered a personal and meaningful project. This visual journal is like those picture books where everything is laid out and captioned. In this book, the visuals and text are illustrated and written by Rothman. Not having lived on a farm before, I found lots of interesting information, You'll read about things like what soil is made of, how trees are planted to protect houses from wind, the types of clouds in the sky, how barns are constructed, development of a chicken embryo, the tools and machinery used for farming, different types of vegetables and animals farmed, parts of an animal, how to milk a cow, and more. The book's 224 pages. The art is in the style of sketches but digitally coloured. Lay out of the book is simple and well done. . It's apparent that lots of research went into compiling the information. The result is a wonderful book that's informative and educational. It's a good book for children as well.